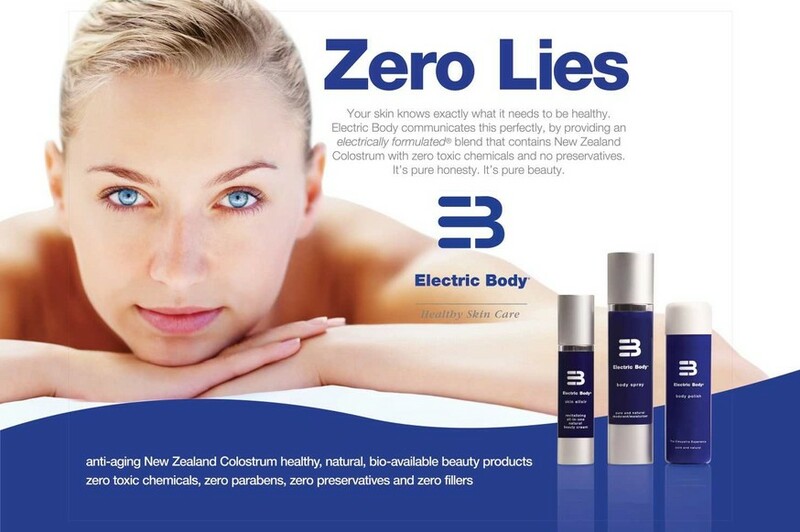 NZ Wholesale Clients please call Anna or email electricbody@xtra.co.nz with your details. I just love Electric Body and so does my baby Bella. The Skin Elixir works wonders if she ever gets any nappy rash. I haven't even got any stretch marks because I have been using the Body Spray every day. And the Body Polish is a great product too - I use it as a facial cleanser and also in the bath. It's great to know that all of these products are safe for me and my baby. I don?t have to worry about my little girl getting any in her mouth by mistake. I am going to tell all my friends with babies that they simply have to get it! Are you in the market for Natural Skin Care and organic beauty products and skin cream? Electric Body provides the products that can help you obtain healthy skin naturally. Our natural and organic product line contains the latest breakthroughs in natural and organic anti-aging technology. Electric body healthy skin cream consists of our signature product - a natural, bio-available skin elixir for the face, eyes, and other sensitive areas, all over natural body spray, and gentle exfoliating face and body polish. We offer our customers natural beauty products, containing New Zealand Colostrum, free of petrochemicals and parabens. A safe choice for you and your family. Our products are natural beauty products made with healthy ingredients with no toxic chemicals that have been linked to cancer. Choose Electric Body healthy skin cream for you and your family. New Zealand Colostrum is THE most powerful life-giving food imaginable. It can help boost your immune system and activate your DNA so that your cells glow with youthful vibrancy with this breakthrough anti-aging technology. Count on Electric Body Natural Beauty products to deliver a safe natural product. Many of the chemicals that are in other beauty products and skin creams have been linked to cancer in scientific studies. Our beauty and skin care products contain only natural ingredients. Matching your skin's needs with a natural-based product is the key to obtaining healthy, glowing skin that feels soft to the touch. Looking for more reasons to buy organic? Natural products, such as our Skin Elixir, made from New Zealand Colostrum and Aloe Vera, are intended to keep skin moisturized and healthy-looking and to reduce the signs of the natural aging process. The New Zealand Colostrum found in our skin cream can help enhance the appearance of the skin naturally without the aid of chemicals or parabens (a chemical often used as a preservative in skincare products). All of our products are free of dangerous chemicals and preservatives. For more information about natural skin products, please call 1.877.317.SKIN (7546) or submit an email inquiry. We will assist you as soon as possible. Feel free to test our great line of natural Skin care products such as the Bio-available Skin Cream today! BUY NOW!